Alpha Sun 24B - Sold Out! SOLD OUT - 60 DAYS UNTIL NEW INVENTORY! Based on the best selling Alpha Sun in the USA, with all the basic features you expect from a premium quality tanning bed, with a Navy Blue powdercoat finish. Unlike "discount warehouse" tanning beds, the Alpha Sun is all steel inside and out. To give you maximum UV exposure, it features individual parabolic reflectors. This means that each lamp is nestled in its very own reflector system, focusing all the tanning power to the tanner. This Alpha Sun tanning bed uses Sol Soft tanning lamps throughout. They are a lower UVB, higher UVA lamp that is famous for deeper, darker tans. They don't "get you red quick", and instead rely on the bronzing action of UVA to build a darker tan over time. People who burn easily, or those who are simply more concerned about the "quality" of their tan really love these lamps. 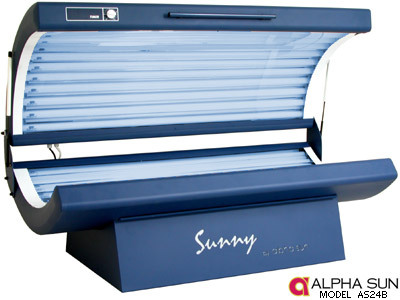 The Alpha Sun "Sunny Series" of beds puts a 100% salon grade frame, shell, electronics and lamps all within the price range of a home tanning bed. They are the same width and basic frame as the more expensive Power 36 Series, without the ballast tray and other nonessentials that are simply not needed in a home environment: All of the power, none of the frills. Structure: 100% steel, inside and out. Alpha Sun tanning beds are built in a completely new, state-of-the-art facility in Chisinau, Moldova by Alpha Industries of Hasselt, Belgium. They are imported exclusively by UVA/TanningBeds4Less and offer the user an excellent tanning experience in a truly salon grade frame, at a fraction of the cost of similar tanning beds. For those needing the most durable of tanning beds or want traditional European style tanning, Alpha Sun is the preferred choice.